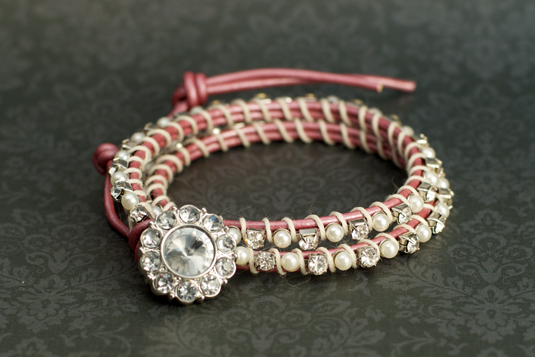 Rhinestone chain is a great choice for making quick and glitzy wrap bracelets. 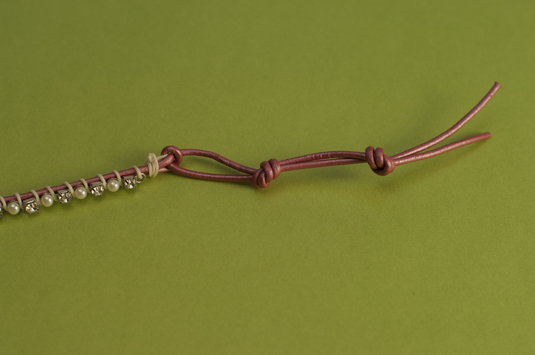 Because the stones are already set in tiny cups and connected, you just need to cut them to the length you want them and then wrap them to the leather bracelet. You can buy rhinestone cup chain in bulk or in individual necklace lengths. If you’re looking to save a little cash, opt for rhinestone sewing trim. You’ll get a similar, though not quite as sparkly, look for less. 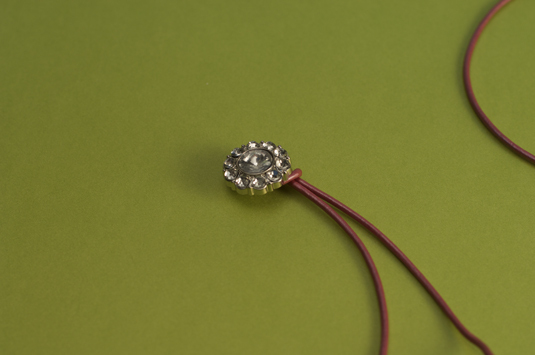 Fold the leather cord in half, sliding the button to the center point. Holding both strands, tie a single knot to secure it. 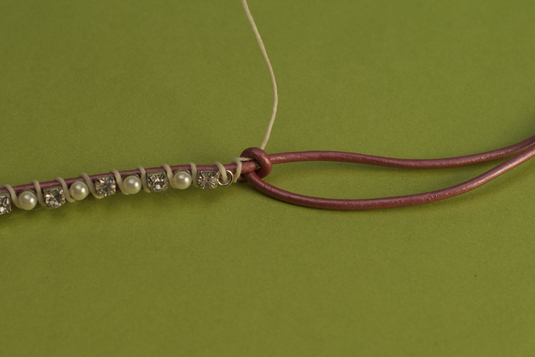 Holding both strands of leather together, tie the cup chain to the leather strands with the waxed linen cord. 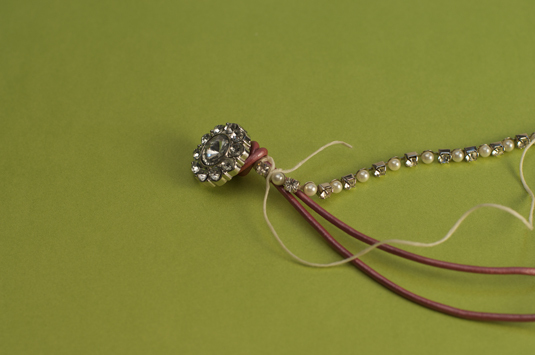 Tuck the shorter tail on the inside of the bracelet. Begin wrapping the waxed linen cord around both the cup chain and the leather, covering the short tail as you go, wrapping the linen between each cup. When you reach the end of the chain, tie a knot in the waxed linen cord. Holding both leather tails, tie a knot, securing the waxed linen cord and trim the waxed linen cord with the scissors. Waxed linen cord is kind of sticky. It naturally holds knots really well, so you don’t need to add glue to the knots. But if you feel better using it, feel free. Tie another knot in the leather about an inch from the last one. If you have enough cord, tie a third knot. 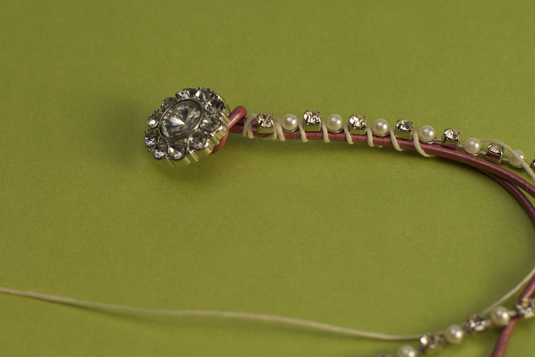 If you don’t, just trim the ends to the last knot to complete the bracelet.